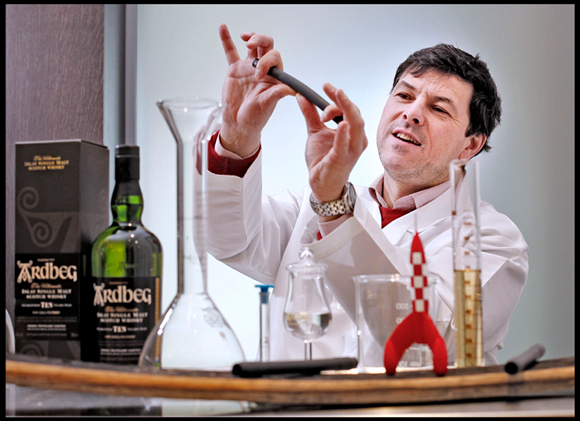 Bill Lumsden, head of Ardbeg distilleries, in his lab (Source: Adberg.com). The scientists behind the research want to understand how the malt and particles of charred oak behave in a microgravity environment. A compound of charred oak and malt particles was launched to the ISS on October of 2011 in a Russian cargo ship, to start an experiment that will eventually allow analyzing how the microgravity-matured whisky tastes like. The charred oak molecules are parts of a set of chemicals called terpenes, which are used to add aroma. The results will give scientists valuable information to understand the behavior of growing particles in an environment without gravity. The experiment, which will last for at least two years, includes studying the behavior of a control group of similar particles on Earth, in order to compare the behavior of the two instances. “By doing this microgravity experiment on the interaction of terpenes and other molecules with the wood samples provided by Ardberg, we will learn much about flavors, even extending to applications like food and perfume,” said the chief technical officer of NanoRacks LLC, “understanding the influence of gravity could help a number of industries, including the whisky industry, to develop new products in the future”.